By Xah Lee. Date: 2016-04-27 . Last updated: 2018-06-02 . This is new, from Japan. This appeared around 2016. It is very unique. 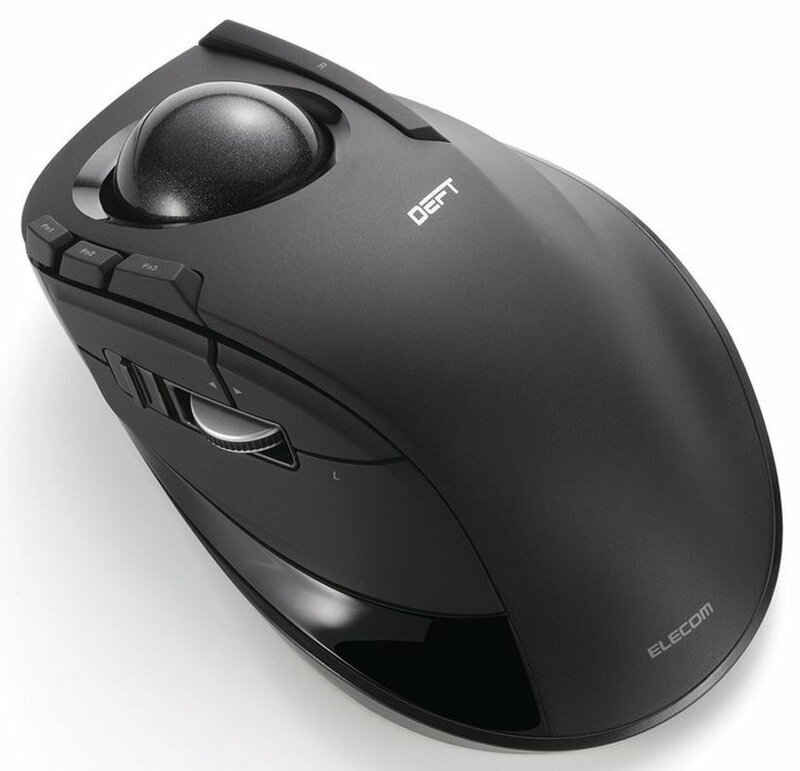 It is just about the only trackball with index finger operated ball, with a scroll wheel (and for thumb), and with 8 buttons, and even a resolution/dpi switch! Both Wireless and Wired are available. Right button on top, a thin strip marked with R.
Left button on thumb side, below the wheel, marked with L.
1 browser forward button. Above the wheel. 1 browser backward button. Above the wheel. 1 DPI switch, in front of wheel. 3 function buttons, on top, left of the ball. These don't do anything by default, and don't send standard usb signals. You need to use their Microsoft Windows software to program them. They don't work in Linux nor Mac. The scroll wheel can be pressed as middle button, and can tilt to the sides. The scroll wheel is notched/clicky. Some reviewers said it's hard to press the scroll wheel, and also hard to tild up. You are likely to lift the mouse when you tilt it up. Works in Linux out of the box, except the 3 buttons Fn1 Fn2 Fn3 on top left. They send non-standard USB signals. 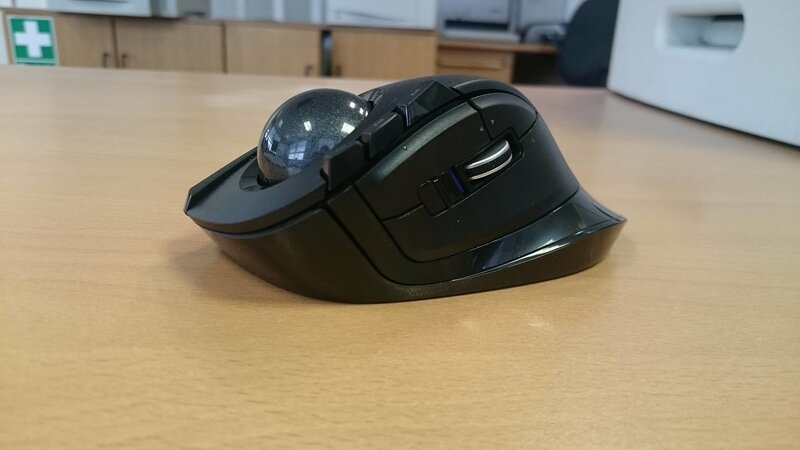 As it is mentioned in the above review this trackball is not for large hands, my fingers are long, so if I put my hand on the trackball to fit it fully, I cannot do anything, because all the buttons and the ball are in the middle area of my fingers. I am forced to put my hand further back to reach the ball, but it opens another problem, the bottom click button which is the main left click, is not reachable for my thumb. I reprogrammed the left click to the upper button which by default is a back button. The ball is small which hinders precision, it leads to frustration when I try to simply highlight text to copy it and it gives more pressure and tension on fingers. Three upper buttons are not functional on Mac, I tried to reprogram them with the Elecom Assistant but it doesn't do anything, tried USBOverdrive app, it handles well everything else but not those three buttons marked Fn1 etc. .
Scroll wheel is great but the position is not comfortable if I put my hand on mouse to cover it fully, I mentioned my trick to overcome this issue above. On linux Ubuntu Gnome movement of the ball is too quick, so you should handle it somehow in linux way. Didn't figure how to program F1etc buttons on Ubuntu, but all other buttons work well. The right click is firm and doesn't get into my way, so I can put my hand on the ball and relax not worrying about unintentional right click. 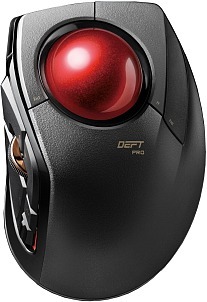 It has a very good scroll wheel, which is much better than any other alternatives like scrolling with the ball, IMHO. The ball runs smoothly and spins very nicely, I spin it sometimes just for the feeling of it. It has all the important functional buttons out of the way, so my hand can relax on the ball as I mentioned in comment about the right click. I think it is super important, because it reduces strain on fingers letting them rest. I am not sure this is the case in such design as Slimblade and Kensington Expert have, but looking at the video reviews I noticed the hands of the reviewer hover over the trackball, so I assume he doesn't want to accidentally press any button, but I might be wrong. I didn't find tilting the scroll wheel to be difficult, when I press it upwards the trackball is fixed by my hand lying on it, so it is comfortable enough. Ball diameter is 34 mm.